Continuing my Pop Sugar Challenge, I pulled out a book from 2005 for this week. It’s hard to imagine that was a full decade ago now. 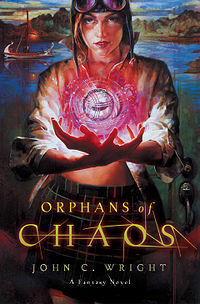 Orphans of Chaos is the first book of a trilogy. I’m planning on reading its two sequels before the month is out, finishing that task for the challenge. With such an odd mix of science and mythology, I’m eager to finish out the series (without having to wait months for release dates, like normal)! What if your teachers taught you everything-except who you really are? Precocious and rebellious, all five teenagers are more than just prodigies. Amelia can see in four dimensions. Victor can control the molecular arrangement of matter. Vanity can find secret passageways where none existed before. Colin is a psychic. Quentin is a warlock. And, as time goes by, they’re starting to suspect that none of them are entirely human . . . This book is nothing like I expected from reading the summary in the library a few words all. Most of it reads like a YA, but I’m nearly certain that I picked it off of the aunt shelves. The writing itself is extraordinary, getting so involved in the small details that you make assumptions about the larger ones. I was sincerely shocked about the twist revealed a third of the way through the novel. It through me off-guard and I want sure if I was going to enjoy the plot after that, but Amelia’s voice pulled me back. I have to admit, the parts that tried to explain the science behind their creation and where they were are far beyond my comprehension. I’d love to hear an opinion on them from my review partner, SA, who is much cleverer when it comes to math and science. I really don’t want to give away any shoulders for this fabulous book, so I can only advise you check your local libraries for a copy as I try to find the sequel. I promise, in the horrible case that the third book ruins everything, I’ll post an update to warn you.